I took this book on holiday specifically to read in or coming out of Cornwall, as it’s set in Somerset, Devon and Cornwall, and in fact read it on the train home, going through those exact counties! 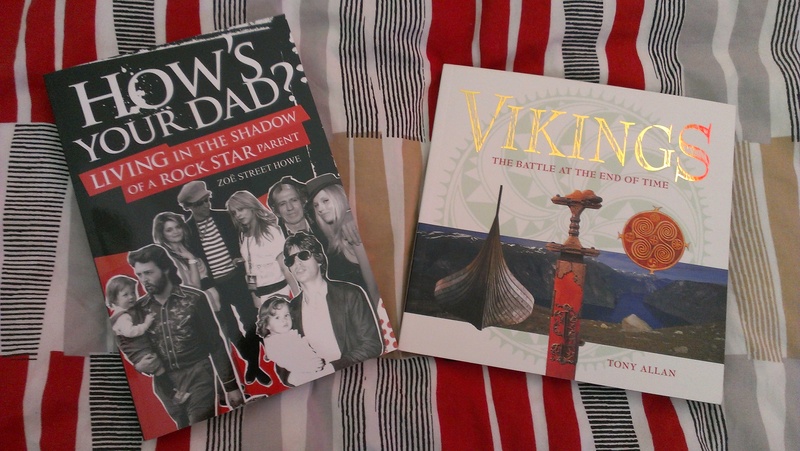 A triumph of themed reading. And as he visits Godrevy, St Ives, Newlyn and Penzance in the book, I’ll share a few photos from our holiday after the book review. There’s no sign of the reading / reviewing slacking off, by the way – it’s marathon time on Sunday and so I’m resting up as much as I can, and will have a v quiet Saturday, then I’ll be recovering from the big effort (I forgot to do that for a bit last time: big mistake), so I hope you all don’t mind almost-daily single-book posts as opposed to the doubles I used to do. The follow-up to his wonderful “Walking Home“, but this time he walks the same distance around the South West Coast Path, starting in Minehead and doing the northern coast, giving poetry readings for whatever people feel they should pay as he goes along. Full again of his laconic observations, people-avoiding and random poetry happenings, and with a new suitcase and old friends, this is a real joy to read – easy to read but not facile or shallow. I loved when the radar dishes he passes turn from menacing, sinister structures to white cereal bowls on the drainer after the washing up as he sees them from a different angle and in different weather conditions, and chuckled at his issues when presented with a special apple by an expert (he doesn’t like apples but when he goes to give it to a horse, remembers he doesn’t like horses much, either). A few poems occur in the text (I think ones he wrote inspired by the journey) and more are mentioned – he does some Gawain and the Green Knight for some children at breakfast one morning, which was fun. Finding fewer birds inhabiting the cliffs than he’d expected, he treats us to a wonderful description of Bempton Cliffs, north of Bridlington, which we’ve visited a few years ago; it’s always lovely to find places you’ve been and things you know in a book, isn’t it (more of that later). He bemoans the up and down-ness of the endless river valleys working their way to the sea and longs for the moors, feeling ungrateful all the way – I love how he includes the bad as well as the good, or maybe I just like a moany traveller (cf. Paul Theroux). The views of St Ives from Godrevy and visit to the seal beaches, with their charming signs asking people not to talk too loudly directly mirrored my experiences only that Wednesday, and it’s rounded off with a visit to the Scilly Isles, where I haven’t been yet (he doesn’t encourage me with his description of the boat over, although it’s lovely that he previously visited the shipyard where the Scillonian was built). A lovely and appropriate read. Mousehole in the sunshine, the furthest point from home on my 10-mile run on Tuesday. I banked lots of good memories and feelings for the marathon on this relaxed run which ended with a local friend joining me on her bike. Godrevy seals. I heard them calling, too! A lovely friend took me there and it was magical. Is it just actually that I read too MUCH? This many! This is how many I’m reading RIGHT NOW! No, no, of course I don’t mean I read TOO MUCH in general, too many books over the course of the year. There’s no such thing, is there? There’s no better thing than reading lots of books (hobby: no better hobby; obviously it’s better to be running around giving all your possessions to Good Causes and generally doing good, but you know what I mean). But I haven’t really finished many books recently – my last review was THIRTEEN DAYS ago and I’ve only finished one book since then, which is waiting to be reviewed. I do have gaps, but this seems particularly shocking. So I have started to wonder if it’s the number of books I am reading concurrently that’s messing things up a bit. Here’s the thing: do you read one book at a time, or many? And, here’s the most important thing: do you think you’re more ‘productive’ if you only read one at a time – do you actually get through MORE books that way? One larger or more “special” book (maybe a Persephone or hardback) which I read in the house, at the breakfast table, etc. This sometimes extends into two books, for example I won’t read a Persephone while eating, so I might have a Persephone on the night stand and a political biography, say, at the table. One smaller and more portable book for in my handbag when popping into Birmingham or going on longer journeys. Now I’m trying to actually READ the books I have packed onto my Kindle, this can take electronic or paper form. Friday to Saturdayish I’m reading the New Statesman on my tablet at the table. Sunday to Tuesdayish, it’s the Saturday Guardian newspaper. Sometimes there’s a bit of struggling slowly through an Icelandic newspaper going on with the tablet, too, although that’s usually upstairs near my dictionaries. I LOVE the New Statesman and I have not once, in the year I’ve been subscribing, experienced Mag Lag with it (when you are still reading the last issue when the new one arrives), even though it’s an (almost) weekly. I like the e-version of the newspaper because I can skim it more. But these two do take away time from reading at the table. I’m currently reading a big fat 19th century novel on the Kindle, which a friend lent to me in paper form, but I wasn’t doing well with the huge unwieldy paperback, so I downloaded a free copy from manybooks.net. I’m reading this at the table and in bed, and on the bus. I have a book of essays from newspapers that I’m reading at the gym. Often the gym book is the same as the handbag book, but I don’t want to sweat all over my Kindle, so started this. I cycle and read for about an hour to 90 minutes a week, so that’s not going to get through much book, even at my speed of reading (for those concerned about my ability to read and exercise vigorously, I do an odd and self-invented form of interval training whereby I pedal very much harder every 5th page). I have a hardback book on the history of the Tube which I picked off the TBR to look at and haven’t really looked at properly yet. I think that’s it, and it doesn’t seem too bad. Is it just because I’m reading a big novel that I’ve got a bit stuck and low on the reviewing front? Should I just knuckle down and read one at a time? After all, I don’t have a problem with “having” to read a particular book, as I read my TBR in acquisition order and don’t get to make many choices based on reading mood there. Or should I carry on as I am? How do you do it? Have you noticed yourself getting through more books using one method or the other, single or many reads, if you’ve tried both? Or should I just go on holiday or get a cold and get them all finished? Book confessions … and launches! 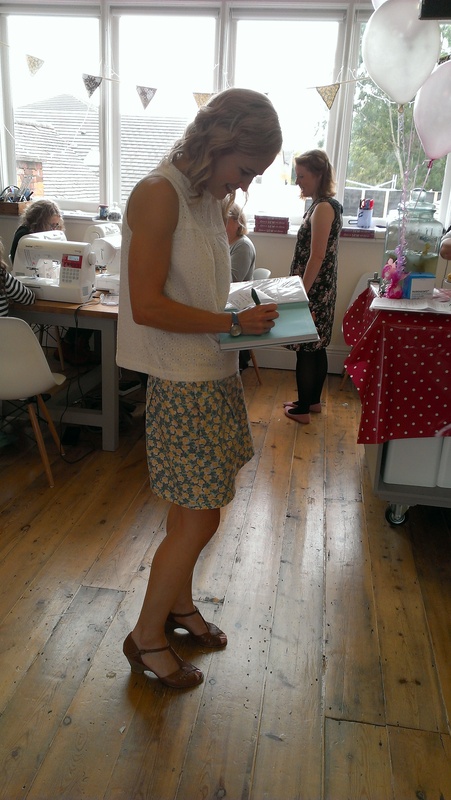 I had a rare little bit of time off yesterday (6 September) as I’d decided to do a book launch extravaganza. Well, two book launches in one day. 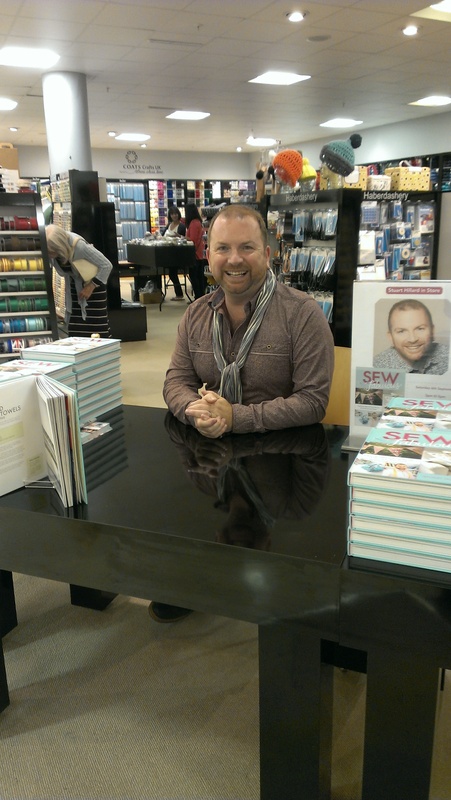 Two of my favourite contestants from The Great British Sewing Bee, Lauren Guthrie and Stuart Hillard, were having launch events for their new books on the SAME DAY, both in Birmingham. I couldn’t resist that, could I? I started off at Guthrie and Ghani, Lauren’s lovely haberdashery and sewing supplies shop (with a lovely training room upstairs) in Moseley. 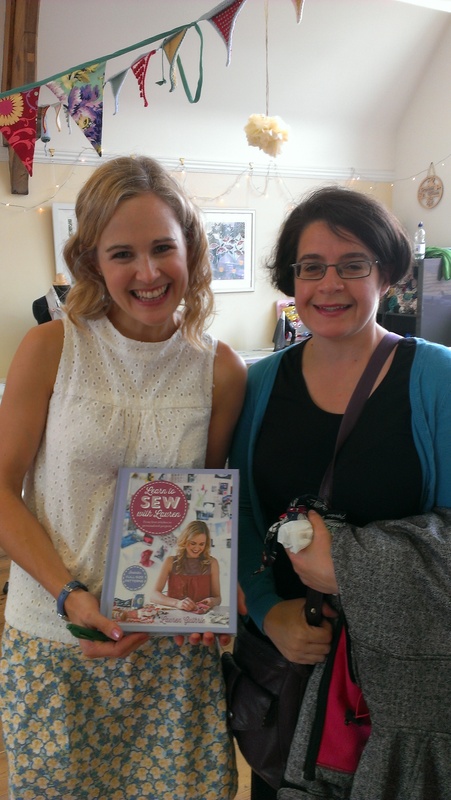 It’s not far from where I live, so I popped up on the bus, met up with my friend Jen, and checked out the shop downstairs (of course) before popping upstairs to see Lauren and have her sign her book, “Learn to Sew with Lauren”. Lauren kindly signed my copy, after we’d browsed through a rail of makes from the book (some lovely bags, pyjama trousers with contrast pockets and a skirt I will customise to be slightly longer for the more mature lady) and oohed and aahed over some new technology to make constructing folding blinds easier – I am SO going on her course on that. 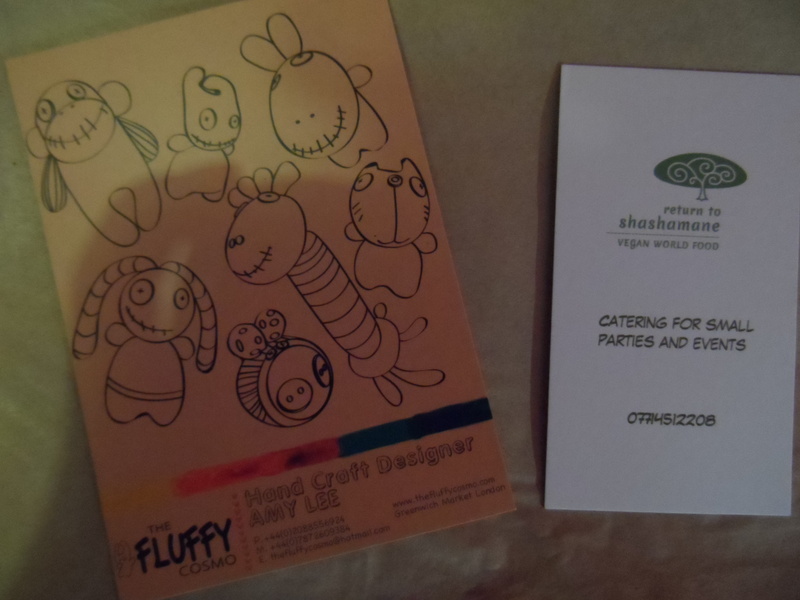 Downstairs were some lovely sewing starter kits, too. 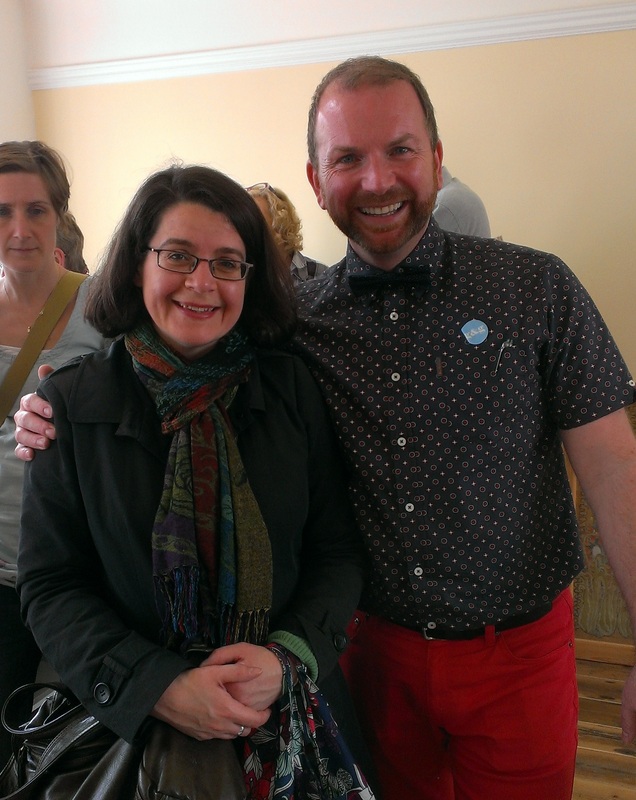 The lovely workshops were going on all day – a friend of mine made a lovely bow hair slide – and what a good idea for a launch day! You can find the full list of the upcoming workshops here. Then it was time for Launch Number Two! I said goodbye to Jen, and hopped on the bus into town, nipping up to House of Fraser in the city centre to see how Stuart was getting on. I missed the giant poster of him which was displayed somewhere around the building, but zipped (ha) on up to Haberdashery, and found a lovely table of shiny books. And there was Stuart, bounding over, not showing any signs of exhaustion from being in the middle of a fairly comprehensive tour of John Lewises, House of Frasers, independent bookshops and independent sewing shops. The department had laid on drinks and nibbles, and of course there were plenty of enticing items around on sale, too. I had to rush back home to put my headphones back on and start transcribing, but what a lovely little trip and two luscious books, both very different with different kinds of project (Stuart’s is all home and garden furnishings and decorations, Lauren’s clothes and accessories, and yes, I perceived NO rivalry between them about their books). 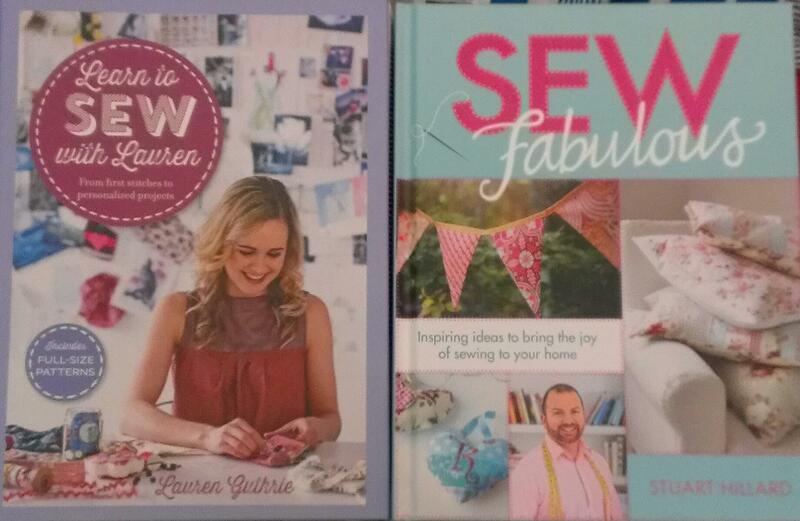 Both books seem to have good production values and have been edited well, at first glance, with both Lauren and Stuart confirming they had full control and input all the way through the process. I will be reviewing them soon and will link to the reviews here when I’ve done them. 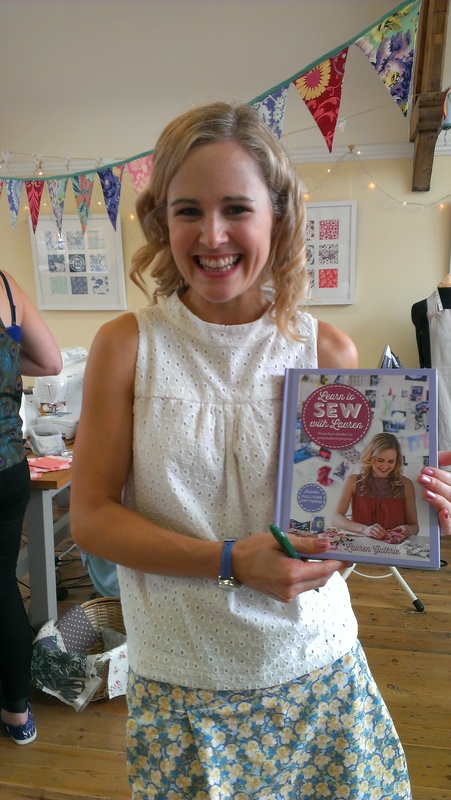 You can buy Lauren’s book “Learn to Sew with Lauren” from Amazon and from her own online shop. 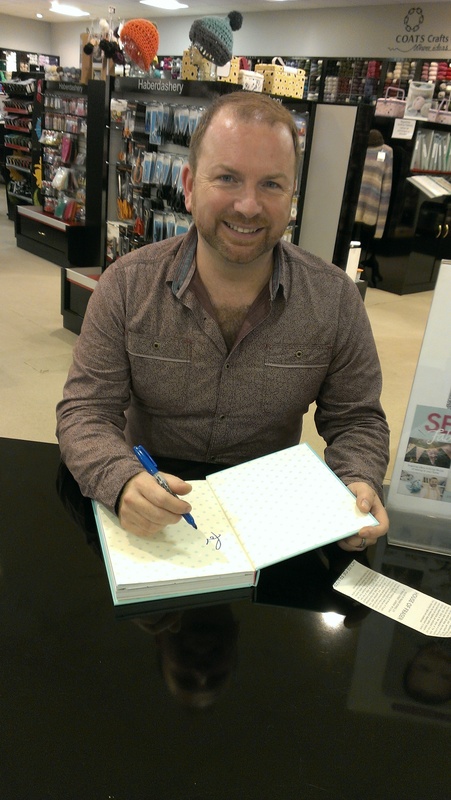 You can buy Stuart’s book from Amazon and his publisher’s website, which also has details of the rest of his tour. 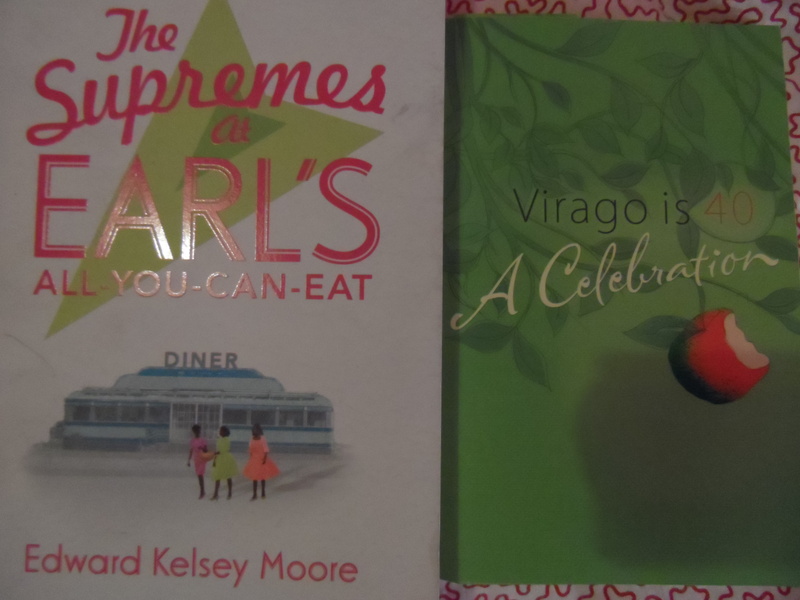 Note: I bought these books at full price and I’ve written this blog post off my own bat because I like these people and want to support their hard work. Any confessions from my readers? Did you go to either of these launches? Have you read any of these books? I’ve been making a real effort to take time out for myself and limit the amount of time I spend working on my business to an acceptable level. Part of this plan involves doing more THINGS and spending more time with the people I care about. I booked coach tickets for £18 return and got on a civilised 8.30 coach in Birmingham. I had bought a Kindle copy of Elizabeth Taylor’s “Complete Short Stories” for this very purpose – I have a lovely copy of the book, given to me by my friend Ali, but that’s a bit unwieldy (and lovely) to be shoved into a handbag. So a back-up Kindle copy was ideal, and I managed to get through loads of them on my two coach trips today. Short stories are in a perfect genre for travelling (as are travel books themselves) as you don’t need long swathes of concentration. So, a pleasant journey down. I’d intended to take a bus journey through Peckham and New Cross, visiting old haunts, but I worried about the time and after asking a surprisingly cheery member of London Underground staff, found myself zipping over to Tower Bridge on the District Line (after my usual procedure of trying to jam a recalcitrant fiver into an Oyster card top-up machine), trotting round to Tower Gateway and confusing myself thoroughly on the DLR. Although I lived in London for 8 years, I didn’t get the DLR very often, and I always either walked or got the bus to Greenwich, so I became temporarily confused and had to do some urgent texting. What did we do before Smartphones? 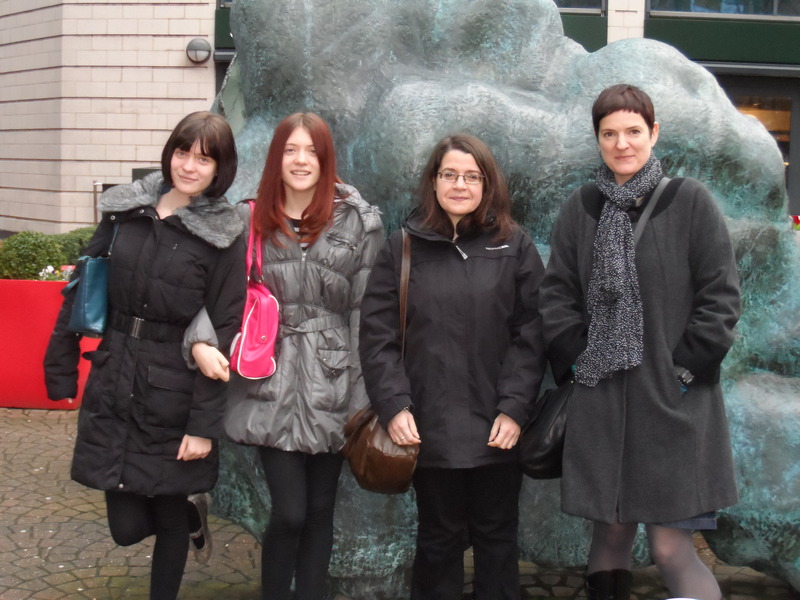 Anyway, I managed to meet up with my dear friend Emma and her lovely daughters, Beth and Grace (I neglected to take a photo, so this is an old picture of us all from Christmas, but Beth and Grace look pretty much the same while Em and I have different haircuts) at Cutty Sark DLR stop. 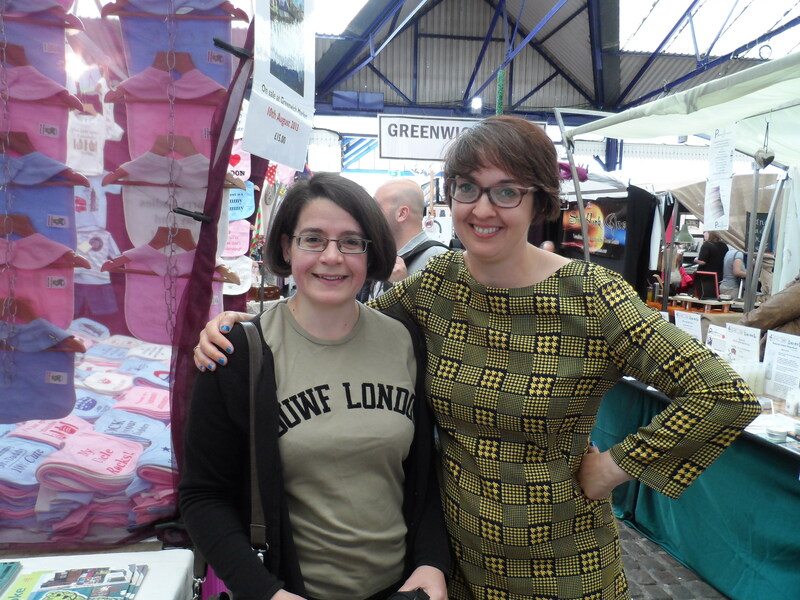 We then went straight to Greenwich Market to look for the Smoke: A London Peculiar stall. After wading through the food stalls we found it, and Jude! I’ve been working with Jude since October 2010, so that’s nearly three years, and I’ve done transcriptions for her almost every month since then. We’ve emailed bits and bobs to each other among the professional stuff, as you do, but I’d never even spoken to her on the phone, let alone met her. I think we were equally excited. She climbed out from around the back of the stall to say hello and have a picture, and we had a lovely chat. And, of course, there was the exciting book. 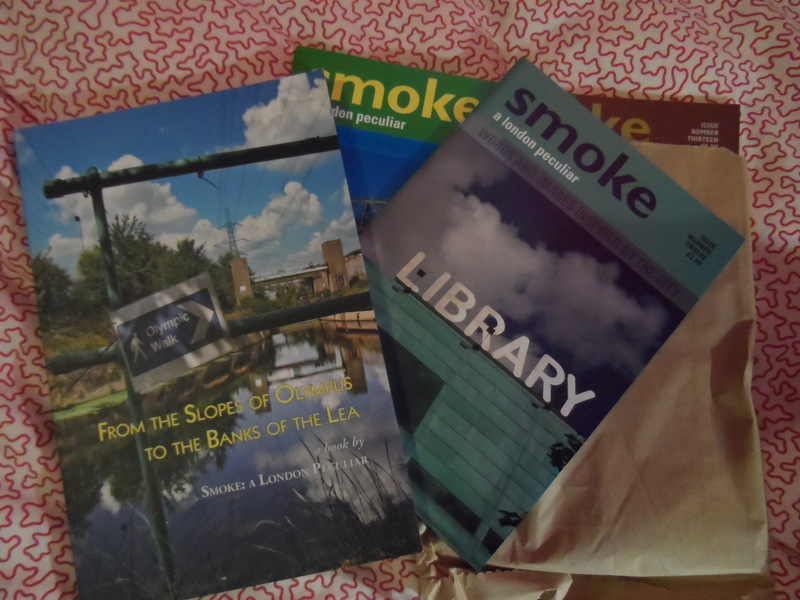 Plus there were back issues of Smoke: A London Peculiar, which is a brilliant magazine with weird and wonderful writing and pictures about London. I bought the first five issues (usually from Foyles) when I lived in London, and I picked up the remaining back issues at the stall, plus the book, “From the Slopes of Olympus to the Banks of the Lea” which looks brilliant. Watch these pages for a review coming soon! We had a wander around the rest of the market and visited a favourite stall of Em, Grace and Beth – The Fluffy Cosmo (see card in picture below). Even though they only visit once or twice a year, the stallholder clearly recognised the girls and commented on how Beth and Grace grow taller every time, while she herself only grows older! How lovely to have that feeling of community in a big city (mind you, my friends had already proved that by running into an old friend from North London, now living in the Isle of Man, as they waited for me!). We were a bit hungry by now, so decided to take advantage of the stalls selling food in the market. Em and I had wonderful packed salad boxes from Return to Shashamane, a vegan food stall. Emilia, the stallholder, was lovely, patiently explaining to me what made up all of the different salads – of course, I’m not a vegan, but I do eat vegan quite a lot as I know there won’t be any animal fats in the food. It was absolutely delicious, with pulses, vegetables and carbs, all packed into a cardboard box with a wooden fork, and really good value. We had a chat about blogging (as you do) and I was so pleased to find a lovely lunch I could happily tuck into. Once we all had picked up some food, we went and sat outside one of the college buildings and chatted in the sun. Em and I have known each other for 20 years now, so we were full of nostalgia and giggles – lovely to just sit and chat and pass the time, no rush and nowhere urgent to go. Once fortified, we had a bit of a wander round Greenwich. 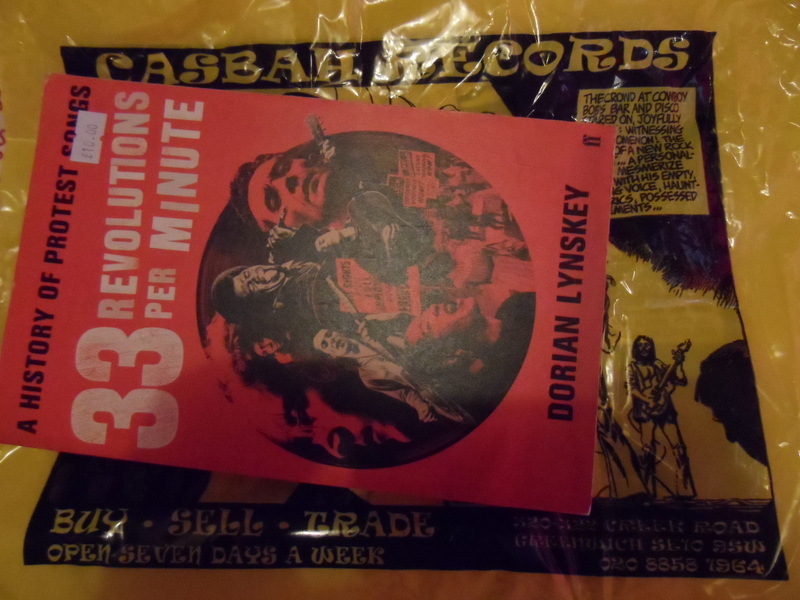 I was disappointed to see that the Greenwich branch of a remaindered bookshop I like had gone, but we had a good search around Casbah Records and chat about music (do I prefer Blur or Oasis? Well, I prefer The Kinks to The Beatles …) and of course I managed to buy a BOOK … well, it’s by another occasional client of mine, so I couldn’t not, could I? By now we had exhausted Greenwich, so we got the DLR back up into central London and went, of course, to the Charing Cross Road. 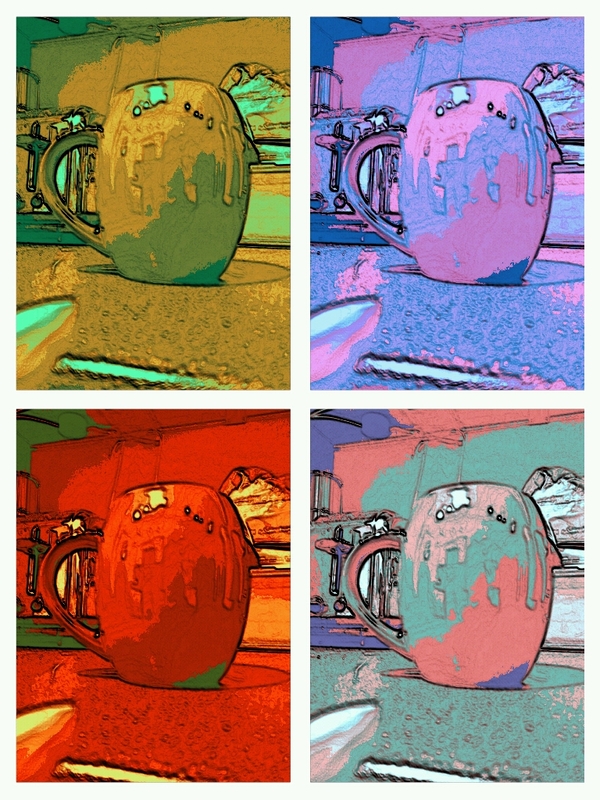 We had a cuppa in Foyles cafe – Foyles is moving soon, so this was probably my last visit to the old shop. Lots more catching up and giggling and talking about music and books and all sorts. I had a very nice iced latte and then we whipped through the bookshop in search of loos (cafes, bookshops, loos … what’s not to like on this trip?). I then said goodbye to my friends and wandered down the Charing Cross Road. Can you believe that I only bought two books at Any Amount of Books? To be fair, I didn’t have that much time … I then had a slightly fraught journey to Victoria, catching a very odd bus in the end which was like a modern version of a Routemaster with two staircases and three doors but the familiar narrow seats and lack of headroom of the old buses (I think it was one of these). After being compelled to eat my salad crouching in front of the parked coach, I embarked for my journey home – more reading and a good journey, arriving 20 minutes early! What a lovely day. I’m so glad that I have the schedule and the attitude that allowed me to have this spontaneous and excellent day out in London! After the sad loss of our elderly cat, Dot, in the fullness of time we felt able to welcome new furry friends and office assistants for Libro. Please welcome Mango and Morgan, who arrived from the lovely Cats Protection today. Update: October 2013. Unfortunately we no longer have Mango, as he was unhappy with us and had some litter training issues. Morgan is still going strong and in fact seems happier as an only. The other month, I had an interesting time with busy-ness and quietness. I’ve been reflecting on it and mulling over this post ever since. Having been wondering if I’d been overdoing it yesterday, I realised it was time to post this out into the world. But I am getting better at taking breaks, honestly. So when it got to the Friday and I’d got through the bits of work I had deadlines for, I then had a lovely long extended lunch break with a friend and her small daughter in the park, and a good long trip to the gym in the early evening, before stopping work for the day. At the weekend, I worked around the rest of my life, working on projects early and when Matthew was out or wanted to watch TV. I even had a good long read in bed after breakfast on Saturday. The post I wrote about presenteeism has helped me here: I realised that I posted a lot about working on social media, and was perhaps thinking too much about how much I work. I haven’t scaled down what I do, but I’ve been aware of not taking too much on, and have obviously become better at scheduling things in and knowing how long jobs are likely to help. Keeping my reading journal on this blog has helped me to be more aware of making time for reading, and I make an effort to have time for friends and Matthew. I feel like I’m getting it more right. I look after myself in the busy spells (and can usually predict them so I can work up to them and come to them healthy and relaxed) and don’t panic in the quiet spells, taking that time to have some time out and enjoy myself. I managed pretty well in the Olympics, watching most of the sport I wanted to see, and fitting my work around it. And I had a holiday in a place without reliable wi-fi at the end of August, and survived, just about, having pre-warned my regular customers that I wouldn’t be very available, and managing to relax about the whole thing. As it comes up to a year since I left my library job and stopped trying to fit two jobs and the rest of everything into one life, I think I’m getting there with getting the balance. And I’ve also been refining my customer base a bit, which is something for another post. If you work for yourself, how are you managing with this aspect? Do share! Ken is 16 now and his brother Howard is off to West Point. Ranch finances have improved thanks to the sheep and cattle, and Nell has her extension and furnace, but the prize bull is terrifying and Nell s having horrible premonitions and feels ill. Thunderhead has got out of the secret valley and is stealing mares to set up a new herd, and when he comes across a prize racehorse filly, Ken gets to meet her owner, Carey, and it’s love at first sight. But Carey has an overbearing grandmother, Jewel can’t be found, and Ken and Howard find themselves squaring up as rivals. The romance, which I loved during my teenage reads of this book, seems a bit rushed and naive now, but Nell’s struggles are heartbreaking. I could go on and on reading about this family and their horses, but this is the last one … Really glad I have re-read them all over the past few months, though. Another from my great Stratford charity shop haul, and a Virago, too. Third in the original Thalia trilogy, being re-read before I get to books 4 and 5, purchased recently, and more wonderful realistic McMurtry. Duane gives up his pick-up truck and starts walking everywhere, for no apparent reason, then living in a shack on his property. There is lots of satisfying detail about how he arranges things, but the local community and his family proclaim his depression. There is a general improvement in the family, however, as everyone pulls their socks up, although golden boy, Sonny, from The Last Picture Show is actually in more of a decline. A great description of psychoanalysis and – separately – the redeeming quality of gardening. McMurtry pulls a shocker with one beloved main character, but it’s mainly great to be back wallowing in the world of Thalia. This is the one out of the three that I’d only read once, and I didn’t remember much of it at all. Oddly, I don’t seem to have recorded a review of my first read, even though I mention it in a review of “The Last Picture Show” in 2000. I wanted to like this, especially as I had found the other two books in the trilogy in January via BookCrossing and bought this second hand so I had the first one, and it is about returning Caribbean immigrants, which is right up my street, but I just could not engage with it for some reason, and gave up.